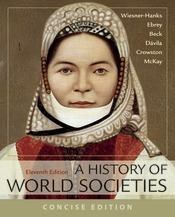 The new Concise edition of A History of World Societies offers an accessible regional chapter structure, readability, and sustained attention to social history in a brief, affordable text. The Concise Edition features the full narrative of the comprehensive edition, as well as a selection of features and tools to engage today's students and save instructors time. Robust primary sources in print and online help students with historical thinking skills. Active learning and assessment options expand with use of the LaunchPad's course space, which combines an e-book with a wealth of time-saving teaching and learning tools. LaunchPad comes with LearningCurve, an adaptive and automatically graded learning tool that students enjoy; when assigned, LearningCurve ensures students come to class prepared. Easy to integrate into your campus LMS, and featuring additional primary sources, summative quizzing, a video assignment and annotation tool, new autograded source-based questions, and a new set of discovery-oriented primary source projects, LaunchPad provides an easy and fun way to help students learn about world history while helping them make progress toward learning outcomes.